The obvious place to start when thinking about animal mouths is how the mouth is used to capture prey. Open Wide! provides plenty of examples of this feature. The ferocious jaws of an eel, the hook mouth of the penguin, and the pointy front teeth of the big cats are just some of the meal munching openings that you will see, but there is much more in this book. You have animals that use their mouths to cool off. Crocodiles can't sweat so their only way of cooling off in the heat is to open their mouths. This is where you understand the strength of Open Wide! You get interesting animal facts inside each poem. It's like my childhood where Mom would buy me a box of cereal and there was a cool toy inside. I would call these toys "Free Insides". 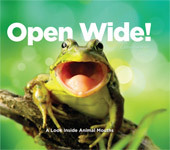 The animal facts in Open Wide! are like free insides to me. One of the coolest "free insides" is learning about the poisonous slobber of the komodo dragon. The brightly colored tentacles of the file clam are another fascinating find in this book. In the back matter, you will see ten other animal mouths where you can make comparisons with the animals in the main part of the book. Open Wide! would be a good book to use for teaching children how to categorize items. You can sort these animal mouths into beaks and non-beaks or sort according to the type of teeth or whether the animal is land-based or sea-based. Another thought is to pull this book out during Dental Health Week and talk about why teeth are so important and how we need to take care of them.